It can be so easy to get caught up in the business element of a business that you forget that, at the end of the day, if your customers aren’t having a good time, then neither will you. It would be impossible to grow your brand without knowing what your customers think of you and in order to set yourself apart with excellent customer service you need first to measure it. Our new whitepaper explains how using Net Promoter Score (NPS) can be a driving force for your business. Considering that customer service is one area in which SMBs can easily compete with bigger businesses and set themselves apart, metrics suggest that only about 17% of all businesses use NPS – compared to 70% of larger enterprises – and that small and medium sized businesses are falling behind. 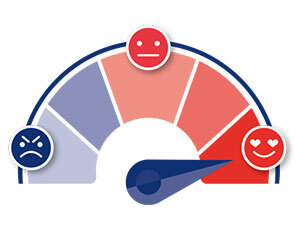 The customer then gives you a score from 0-10, which – depending on how good they’re feeling about you! – places them in the category of ‘detractor, passive or promoter’. The NPS score itself is then the difference – positive or negative – between the percentage of customers that would recommend the company and those that wouldn’t. Sounds complicated but it’s not so bad – the whitepaper goes into more details on the technicals. Ultimately what you end up with is a score ranging from -100 to +100. +100 would be pretty much unheard-of incredible and -100, unsurprisingly, not so great. A score above zero is considered pretty decent because it still means you have more promoters than detractors, and anything over +50 is pretty amazing. But, even if you put this metric into place and gather all this data, there’s not a whole lot of point unless you’re actually going to use it. This is what our whitepaper examines further, and illustrates how nailing customer service can to lead to better customer retention, better reputation, and quicker growth of your business. At UKFast we pride ourselves on having an NPS consistently over +70 – at the time of writing it’s +76.36%, which means our customers are 10 times happier than average. Download the whitepaper now to learn more about NPS and if you’re interested in finding out more about why our customers are so happy, take a look at our website.